They began as tools in military combat. Now aerial drones are being considered by Bay Area law enforcement agencies as a cost-cutting way to replace helicopters, and use technology to fight crime and save lives. Alameda County Sheriff Greg Ahern first tested one of these Unmanned Aerial Systems or UAS about a year ago. Now he’s looking into possibly bringing a drone here. His office would be the first in California to do it. Armed with live-video-feeding capabilities and different features, like infrared devices, these drones can cost in the ballpark of $50,000 to $100,000 dollars or more. There are several different models, but the one Ahern is considering weighs four pounds and spans four-feet. He says the drones get a birds-eye view that most tactical officers on the ground would never get, sometimes endangering their lives. A demonstration at the county’s Office of Emergency Services building in Dublin a couple months ago featured a man standing in the shadows on a rooftop, with three possible explosives clearly in his reach. The drone saw everything; the officers on the ground could not. 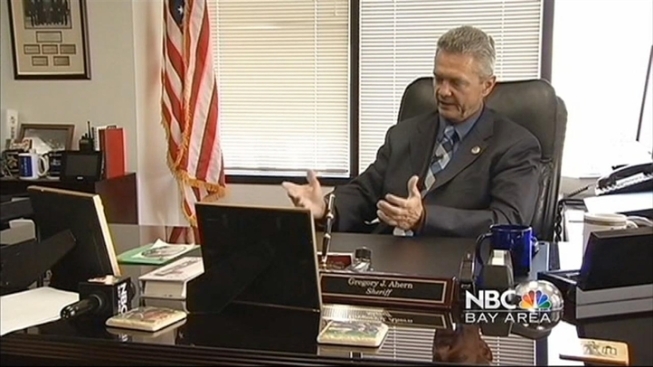 “Very valuable to any tactical officer, as you’re setting up your perimeters and knowing what the suspect may have in his hands, how the suspect is dressed, what are the avenues of escape?” Ahern added that his office would only use drones during emergencies, from a high-speed or high-risk chase to search-and-rescue operations in disasters, as well as proactive policing measures like catching marijuana grows in fields on public lands and in grow houses. In two weeks, the Alameda County Sheriff’s Office is hosting its annual “Urban Shield” preparedness exercise involving about 30 other law enforcement agencies. That’s where they’ll get the chance to test out different drones in simulations of disasters and high-risk situations to see if they really work. If so, Sheriff Ahern says he has been looking specifically into a federal grant that promotes community policing.